The Organization of American States (OAS) and the Latin American Federation of Banks (FELABAN) today signed a cooperation agreement for capacity development on cybersecurity in Latin America, at a ceremony held at the headquarters of the hemispheric institution in Washington DC. General Secretary of FELABAN Giorgio Trettenero said the agreement "will allow us to unite efforts in a topic of high impact and importance for the banking of the region such as cybersecurity". He also recalled that during a recent strategic planning meeting of FELABAN "Cybersecurity was the issue of highest priority and importance of the management agenda of the institution." 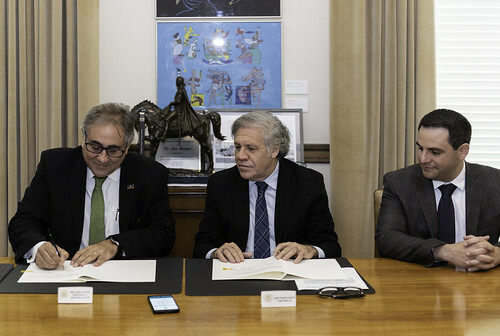 For his part, the OAS Secretary General, Luis Almagro, said that for the Organization it is essential to collaborate with the private sector, particularly the financial sector, in the development of cybersecurity capabilities in Latin America. "FELABAN is a leading ally in the formulation of cybersecurity policies as a promoter of understanding among the different financial entities of the region, as it contributes to the unification of banking practices at the service of citizens, especially those with fewer resources," said the Secretary General.